The ancient Palazzo Davanzati, located in the historical center of Florence, is the unique setting of a very special aperitif every Friday evening running until February 1, 2013. The initiative is called “Aperitivo ad Arte” which started this past summer at the Uffizi Gallery and then at the Bargello Museum. If you’re traveling to Florence by February, this is an extraordinary opportunity that I suggest you take advantage of! In addition to a good aperitif, you can visit the museum where several of the rooms will be the settings of brief theatre performances representing scenes of Florentine life in the medieval times. The aperitif at the Davanzati Palace is from 7pm to 10:30pm and costs €15 per person. Reservation is recommended by calling this number: 055-294883. The initiative will be suspended on December 28, 2012 and January 4, 2013. What and where is Palazzo Davanzati? The Davanzati Palace is a majestic historical building from the 14th century situated on Via Porta Rossa, a few steps from Piazza della Signoria in the historical center of Florence. During the centuries, the palace was the property of several important Florentine families until the mid-20th century, when it become property of the Italian State. Nowadays, the palace is the base of the “Museum of the Ancient Florentine Home” whose aim is to show us how a noble, Florentine family used to live in the past. The palace preserves several artworks from Florence’s museums. 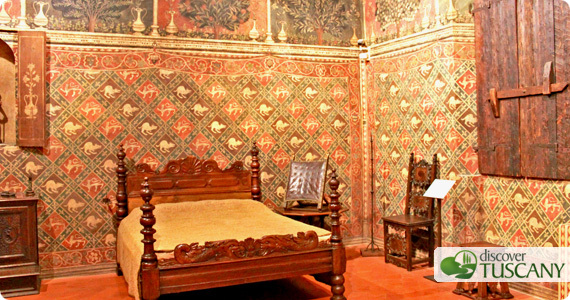 The rooms of Palazzo Davanzati are decorated with antique furniture and marvelous fresco wall decorations and is an excellent example of a medieval house in Florence. Tip: Do not miss the extraordinary view of Florence you can enjoy from the loggia at the top floor of the building!